The mainstream Churches of all denominations aligned themselves with the LTTE in varying degrees of connectivity. In particular, the clergy in the Tamil-dominated Churches threw their full weight behind the Velupillai Prabhakaran’s one-man regime. At the grass root level as well as the international level Prabhakaran could not have dominated the Tamil constituency and got away with his brutalities without the blessings of the Churches. The Churchmen, some of them drawn from the Churches in the Western world, including Australia, became the most formidable shield that gave him cover – not to mention a legendary status — even after he was banned as a ruthless terrorist. Some of the Churchmen, in fact, were falling over each other to propitiate Velupillai Prabhakaran – the mass killer of his political rivals and Tamil dissidents. Lending an ecclesiastical, if not a theological, hand to maintain his fascist regime was the accepted norm of the time. 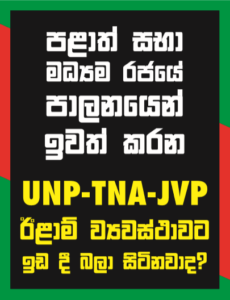 I am instructed by my client, Jayantha Samaraweera-Member of Parliament of Maawala, Waadduwa, to inform you of the following matters.